Excel Add-in for Dashboards Creation and Data Analysis ANALYSISTABS! 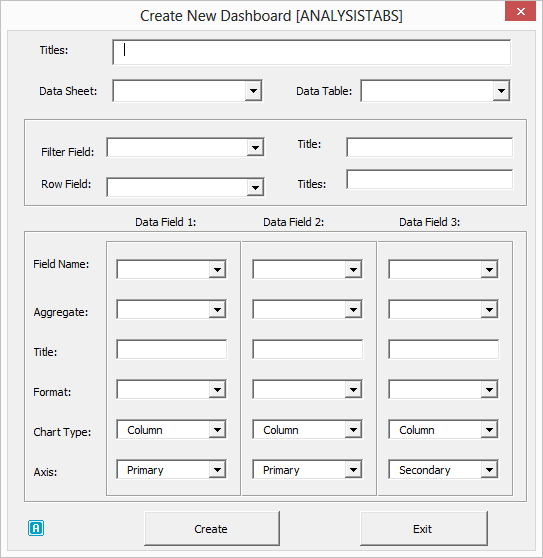 ANALYSISTABS is a FREE Excel Add-in for Data Analysis and Dashboard Creation, Power-Packed with Innovative Utilities. Our objective of developing ANALYSISTABS Add-in is to help you to quickly create rich visualized Dashboards, Reports, Charts and Tools to fasten your tasks. And we provide practical examples and real time dashboards to make you Awesome in Analytics and its relevant tools (such as MS Excel, SQL, SAS…). ANALYSISTABS is absolutely a FREE Excel® Add-in with no executable files. You can download and install easily on any computer, at office or home. 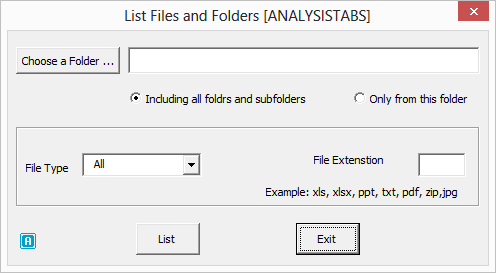 Download ANALYSISTABS Add-in for Excel 2007/2010/2013. ////Sorry! Currently not available for download! We are re working on the add-in and planning to release in September 2016. Thanks for your support! We are re working on the add-in and will be available in couple of weeks. Thanks for your support! Example Dashboard is prepared using Excel 2010, Install our add-in and then open this example dashboard to check the add-in functionality. Please leave your comment or feedback or ask any questions and post issues related to Our Add-in here. What’s New in Version 5.0.0? Now you can test your Excel Workbooks and create optimized workbook. Now your Excel File size will be minimal with Workbook Optimizer and Suggestions. Many of our friends have been requesting me something like this from last two years. And I thought, it will be useful to every one to build optimized Workbooks. Create interactive dashboards in just few minutes with no knowledge of VBA. Dashboard builder is provided for creating rich visualized dashboards. It will help you to create summarized Pivot table with linked chart. You can select desired table and set as a data source. There are three options provided to set a data filter, set row labels, to set data values with chart option. You can choose from the different chart options and chart axes. And you can also set the units to display in the chart and summary table. Can you believe this! 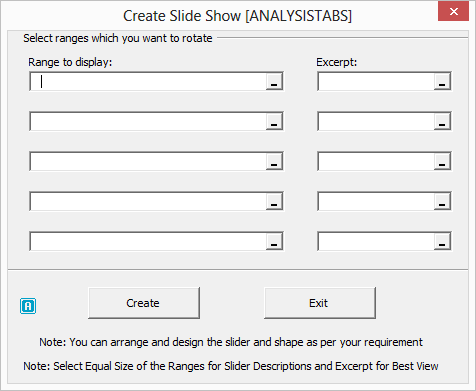 Now you can create beautiful sliders in Excel Worksheets. Sliders help you to present your data from different worksheets of the workbook in one place without duplicating or copying the data. Our Slider creator is very powerful and easy to create sliders with One Single Click. We have provided option to show Excerpts. And comes with a slideshow option and navigation option. Give a try, you will definitely like this idea. Make your Worksheet look like a webpage. Our Widget Creating Utility helps you to create beautiful Widgets in any where in your Worksheets. It is very useful for showing insights or message to the user while presenting the dashboards in executive meetings. It is very useful to show more information in less screen-space. User can expand or collapse one or all Widgets in the worksheet. You can customize the look and feel of Widget by using built-in formatting tools in Excel. Give a try, you will like this idea too. TOC (Table of Contents) helps users to navigate form Index worksheet to any other worksheet in workbook. 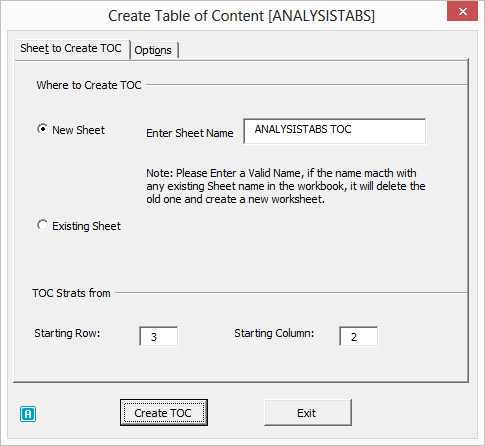 Now you can create a Table of Contents with our TOC Creator with a button click. We have provided many options to customize the look and feel of TOC. And you can provide back to Index page from each worksheet. And you can also choose the range for back link. Presenting the data is crucial after performing the data analysis. 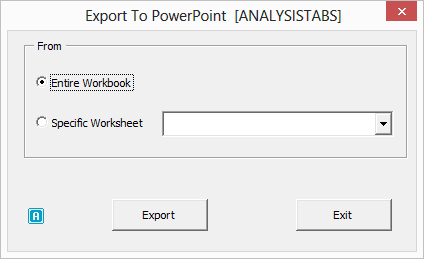 Export to PPT utility will help you to qickly export all charts in a worksheet or workbook to PowerPoint Presentation. We will add many more options to customize the export options. You can check your folders quickly for a particular type of file using List Files and Folders utility. It will populate complete information about the files and folder. 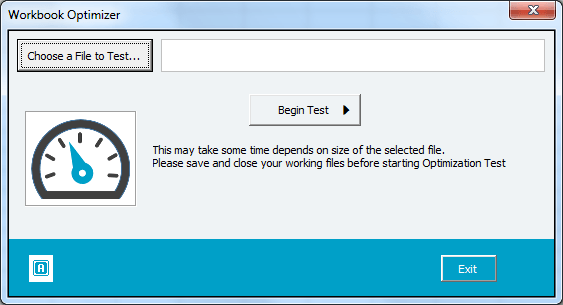 It will be easy to analyse your files and folders using this tool. There are many other useful tools to deal with your workbooks and worksheet. And Knowledge Base is created to help you to learn Data Analysis Concepts and its relevant tools to deal with your data. There are many tutorials in our blog and you can directly access our blog and tutorials from ANALYSISTABS add-in. I will keep on working on this tool to add more and more utilities to best suit daily excel user needs. You can directly update our tool with single button click. Hi, This Add-in is not available. the download link is broken. can you fix it? Sorry -I am fixing few issues and this will be available soon. Addin! is Awesome. Looking for more AddIn’s. I would really appreciate it if anyone has a copy of the old AnalysisTabs exe – I had it and unfortunately my PC crashed and never had a backup. I would really like to use the old version while the new version is still not available for download. Cool, I like the approach. Thanks for giving a stunning dashboard creator! Absolutely excellent VBA Excel website I’ve ever seen!!! I installed the Add-in today. It is a great add-in. Only few broken links: Error 404 – Not Found, if click on BLOG, and the first two links in Tutorials. Thanks for trying our Excel Add-in. Yes, I changed lot of things in website. Tutorials and Blog links may not rout to the correct page. I am working on few more things and releasing with the next version very soon. Could you please let me know your operating system and MS office version installed in your system. so that I will test and fix it. I am using Win 8.1 with Excel 2010 64bit and I get an error. Would love to try this add-in, but can’t get it to work. I think it is having problem with Windows8+64bit. I will fix it and release as soon as possible. Your program generates an error when trying to install in excel 2013 64bit.. The error says it can not compile your code in my excel version! Hi Butch Barker, I am planning to release the next version by 1st August with few more useful tools. its September first, when will it be ready? Hi, I have Win7 and Excel 2010 in Spanish. Could that be the reason why this add-in is not working for me? That should not be the case, I am updating the add-in and releasing in couple of weeks. Hopefully, the updated version works for you. For further info, the error is: “Compile error in hidden module: modUpdate. This error commonly occurs when code is incompatible with the version, platform, or architecture of this application.”. Regards. Thank you Sebastian – I will make sure to test in all version before releasing the next versions. I stumbled upon your website while googling for Excel VBA. When I explored your website i couldn’t leave before commenting and appreciating your work here. This add-in is awesome. Tools you have given in there is totally worth it. Dashboard creator is superb. I am curious to know the code behind it after using the add-in. (Magicians don’t reveal thier tricks, I know! :D) May be i can learn that in your online course on VBA. Again want to thank you for awesome content and information here. Keep up the good work. Hope will see more great stuff from you. I am anxious to try the Excel add-in, but it will not download. I have tried removing popup blockers, IE, Chrome and Fire Fox. Still no luck. Is the link broken? I believe the download ling to Analysistabs is not working. I have no popup blockers and tried IE, Chrome and Firefox and none work. The demo downloads do work. I just downloaded the free add-in. I have Microsoft 2010 on a Macbook Pro. I can’t seem to figure out how to get the tab to show up in my excel worksheets. The download was successful, but there nothing happened after I clicked on the download. If you have been able to get it to operate in this environment please let me know where it can be downloaded. Thanks. Looks to be an awesome add in. Still working on the issue, may take couple of weeks. I have tested on my PC with Windows 8.1 and its working fine. But when I check it on my friends PC, it is not working. I am still working on it and update you soon. Love this add-in, but when I close Excel it disappears and I have to download again. Why? place your addin on following path then problem will solved. Could you please guide me to how to use Dashboard Builder? How does it work? Iam using Excel 2013 64-Bit Version.The addin and related Macros are not working. The error is “Compile error in hidden module: modUpdate. The PtrSafe function should be used whenever Functions are declared to make them compatible with 32 and 64 Bit Excel 2010 and 2013 Versions.Hope you correct the code and provide the fresh add-in for everyone’s use and benefit. Thanks a ton for all the knowledge sharing. I am using Excel 2013 on Windows 8.1 64-bit and as has been mentioned above, the add-in shows a compile error. Since it is a protected module, there is no way for me to change the VBA code as well. Could you kindly fix this problem by any chance? I don’t have a clue how to use it. I keep trying to type in the fields and nothing works – beautiful demo – but how do I get the add-in to work for ME? Sorry for that, we are working on next version and we will provide a video tutorial while releasing the next version. I am using MS Office 2007 and I am anxious to try the Excel add-in, but it will not download. I have tried removing popup blockers, IE, Chrome and Fire Fox. Still no luck. Is the link broken? Add-in will be available by 25th for downloading. Excel 2013 – 64 bits. Compile error in hidden module: modUpdate. Could you please download the latest version and try one more time. I look forward to using this addin. Thanks! Analysis Tab is awesome, however it is not resolving my purpose completely. The tab is pulling the file names from the folder but I still need to check the names manually to find if anything missing. We save some same set of files each day in particular folder, so what I am asking is if we will save one template with all the file names and run this macro, then through formula is it possible to check if file exist or not and will revert with “Yes” or “No” then it will be great. I am not very good at excel so it is difficult for me to frame the formula. Can you please assist me if possible? Hi, I really liked your add-in. I appreciate your hard work. Keep it up. I’ve downloaded Analysistabs. I figured out how to keep it installed. But so far I can’t seem to get it to do anything. Specifically. Clicking the Dashboard Builder opens the form and nothing else happens. None of the dropdowns populate. I’m using Windows 7 Enterprise Service Pack 1. 32-bit OS. Your data should be a Table. You can select a range of data and goto insert tab and click on the Table command to change to a Table. now you can see the drop downs with the worksheet name. You can download the demo file and practice withe sample data. I am using excel 2010 addin is not working. It says not compatible. Pls do let me know how can I get this enabled. I tested on Excel 2010+32 bit. It is working fine. It is not properly working with 64 bit. I amy trying to fix this issue. I will update once it is done! How about getting that Video Tutorial out. Would sure make this more usable for us novices. Sorry about that, Lots of work at office. I am trying my level best to preparing the demos. Please give me some more time. Thanks for your patience! PNRao! Please click on the ‘Download ANALYSYSISTABS Version 5’ link and it will download the add in. You can then add to your excel. And you can see a new ribbon tab added to your excel application. Great job buddy..very good site to explore and learn….regarding add-in I am unable to use dashborad builder and slide creator. Rest is working fine!! Is there some problem or process that I need to follow. The current version of Add in is not properly working for some of the users with 64 bit version, I am fixing those issues and releasing the next version ASAP. You can use this add-in and no need to follow any process. Its also not working on my 64 bit system. Previously on my old laptop it was working fine. Kindly fix the issue asap. Yes, it is not working on some of the 64bit machines. We are changing the entire code and release the next version with the additional tools (we make sure that version will work for all the PC both 32&64 bit). I am trying by best to release ASAP. Please add examples of Advance excel which use by MIS analyst. so that i can learn. Thanks for your suggestions. It would be great if you can provide most frequent requirements in MIS. So that we can prepare the tutorials with the solutions here. Use of all the ribbon tools code with example home toolbar, insert, page layout, formulas, data, Review, view it will be greatful if u explain. Exactly! we both are thinking on the same line. Yes, it is getting ready! Currently we are focusing on VBA Code Explorer, and we are going to add macros for most useful ribbon commands in couple of weeks. Your comment is important and definitely motivates me to implement that faster. Please could you notify me or send me the dashboard creator once available? Sorry for the inconvenience. We are bit busy in working on our new project. We will definitely inform you once we activate the add-in. Thanks for the feedback. Currently, we are investing our time for new tools, we will definitely launch this in couple of weeks. if you use this plugin can the dashboards be shared with users who do not have the plugin installed so they can see the dashboard results? ETA on when this will be available for download? when your Dashboard add-in will be available…..? I am looking to upgrade but unable to do so, since you are in some kind of development mode…! Thanks for showing interest on add-in to upgrade. We are currently working on VBA Online classes. We will inform you when we launch our next version of add-in. PNRAo, I understand you are currently working on the add-in, has anybody got copy of this old file. thanks for your help and support. There are some bugs in the old add-in. We are working on it. It will be available in couple of weeks. When add-in will be available? its showing Download Not available, could you please fix. Hi is this feature going to be available?